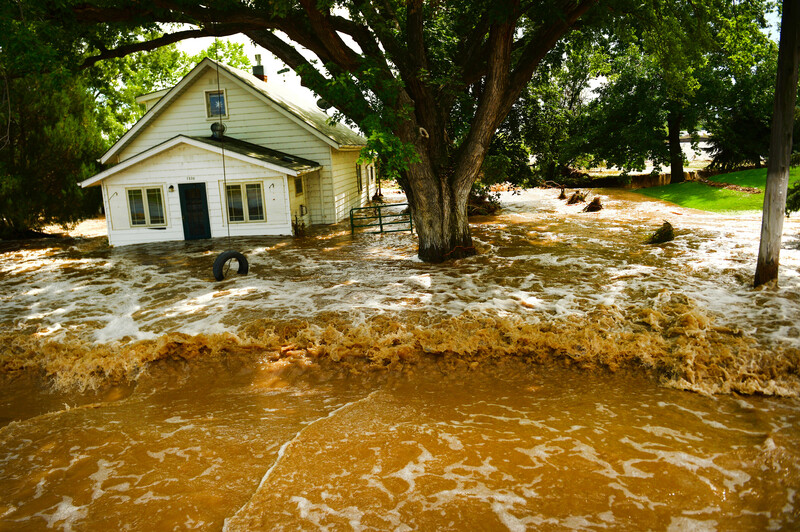 Significance – Flash flooding has a long history along Colorado’s Front Range. The Indians shared what they knew about the raging waters, but when the white men arrived, they ignored the local wisdom. They built the settlement of Denver on the banks of Cherry Creek and paid the price. Inscription – The legend says that Denver-s early settlers, who made their camp on the banks of Cherry Creek, laughed at the Arapaho, a local Indian tribe, for making their camp inconveniently far from the waters edge. The Arapaho warned the settlers of floods, but the settlers refused to believe that the tiny trickle of water in Cherry Creek could rise enough to damage their settlement. In 1864, the waters rose, as they periodically do, and washed away the low-lying portions of the settlement. Details – In late1858, when the first white settlers began building near the dry beds of Cherry Creek in Denver, local Arapaho Indians warned the new arrivals that the river could have an angry and unpredictable spirit. “The Indians predicted there would be a great flood and warned not to build in that flood plain, but, as usual, the palefaces ignored the Arapaho who had lived here for decades,” observed University of Colorado Denver history professor Tom Noel. Among the group of settlers who ignored the Arapahos wisdom was newspaper publisher William N. Byers. At the time, Denver City and Auraria were competing mining towns, perched on opposite banks of the Cherry Creek. Denver sat on the on higher ground of the northeast bank. Ignoring the Arapaho advice, Byers constructed the building for the Rocky Mountain News the Colorado Territory’s first newspaper – in the dry bed of Cherry Creek. Legend has it he chose that location to express his commitment to both of the rival towns of Auraria and Denver City. The newspaper office was one of many buildings planted on piles in the very bed of the creek itself. In 1862 and 1863, Colorado suffered from a severe drought. Then, in 1864, they say the rains returned to Colorado with a vengeance. Day after day, massive thunderheads rolled across Colorado’s Front Range filling the lakes, streams, ditches, and thirsty soil with rain until the entire area was so saturated it could no longer absorb another drop. Denver didnt realize what was going on. The city received average rainfall and the people of Denver were wholly unprepared for what was to come. You see, since 1859 Cherry Creek had been dry within and several miles of Denver. There was but a little water in the creek at any time, and the settlers consider it to be a dry stream; little attention was paid to it as a water-course until it was too late. The Denver City/Auraria flood followed the typical regional weather pattern of drought followed by flood. When a drought occurs the plants die, so there are no trees, grass, weeds–roots–to absorb and hold the rain when the drought eases. That’s why this weather pattern leads to flash floods. Climatologists would not have been surprised by the events of May 20, 1864, but the people in Denver were overwhelmed when a wall of water barreled down Cherry Creek smashing into Denver City and Auraria. As it travels downstream, the waves filled with the remains trees, brush, furniture and humans. The bridges of the period were low wooden structures, just high enough to obstruct the passage of the torrent which came down, and to spread it far and wide and high, in its devastating course. Most of Auraria was quickly underwater. Nathan A. Baker was in the Rocky Mountain News building that night and recalled being awakened by a roaring noise. I looked out of the window and saw a wall of water six feet high rushing down the dry creek bed at terrific speed, he wrote. Before we could escape from the building, the flood waters reached an embankment connecting the plant with the high shores of the creek. In a few seconds we were completely isolated, with raging water surrounding the building. Rescuers standing on the banks threw ropes to the stranded News staff. They escaped the deluge by crawling hand over hand along the rope to shore. “Fierce as ten furies, terrible as hell,’ recalled Professor O. J. Goldrick. All the bridges across Pattee and Cherry Creeks were swept away, and hundreds of farms for miles above and below them, with their growing crops, were completely ruined. Some places were covered with water from six to twelve inches deep. “Auraria, where the Auraria higher education campus is today, was underwater. And quite a few buildings were washed downstream,” observes Noel. Not knowing for certain the number of transient folks in the town, or those in the upper ranches who went missing in the 1864 flood, but its estimated that 15 to 20 people were killed and property damage estimated $1 million. They say about 50 dwellings swept away and large numbers of cattle and sheep were drowned. The trauma of the flood ends on a positive note the wall of water washed any hostility between Denver City and Auraria. It also put a stop to construction on the treacherous sands of Cherry Creek. West Denver, being on the lowest ground, was abandoned with proprietors establishing themselves in the east division of the city, which was rapidly acquired prominence and importance. Can you explain a watercourse? Why did the settlers disregard the advice of the Arapaho? What is the weather pattern that leads to flash floods along Colorados Front Range? What do you think would happen if there was a flood today? If there was a disaster, what would you save?